Yesterday J and I went down the coast to visit the fat one (our niece) and her parents for her mum's birthday! We went to the Max Brenner there in BroadBeach I believe it was, anyway here is a map to it. For those of you who don't know and honestly I don't know how you can't know what Max Brenner is, it is a Chocolate Bar. 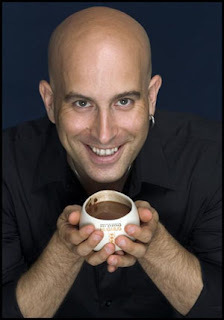 I remember my first encounter with 'The BaldMan,' it was during my first year at Avondale College and I was out late with my sister (a chocolate Lover) and her friends. One of them suggested we go to Max Brenner, and during the thirty minute drive to the place I got a complete review of how incredibly amazing this place was. To be honest I did love the atmosphere and the look and the chocolate of the place, but it was over crowded and expensive. Since then I have been back when I wasn't on a college budget and I enjoyed it quite a bit more, but it is still expensive. Yesterday half of us ordered the Babka. 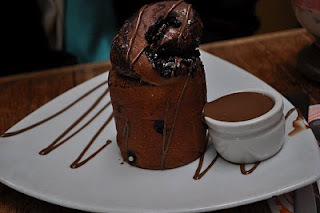 I think that is what it was called, anyway it is essentially a tower cinnamon roll, just replace the cinnamon with chocolate and ad a little shot of dipping chocolate on the side. It is really quite delicious. I had the Mocha, which was very nice, very very sweet but very nice. And the birthday girl got a white chocolate Chai Tea, and she seemed to enjoy it. Needless to say we were all on a chocolate high. Even little Faddi, she is pulling her chocolate face below. Half the fun of Max Brenner are the funky cups and mugs they have made special for their store. One of which is called the "Hug Mug" It just goes to show a few simple details can take a store a long way. All in all this is one of the best Max Brenner's I have been to, the service is quick, which is rare for a MB, the it is not over crowded and has a lovely outside seating area. If you are looking for a special afternoon delight, this is the place to go. And they even have a few things on the menu for non-choclate lovers. J's favourite is the 'Pink Granita' (passionfruit and strawberry smoothie) even though he says it is a girlie drink. Of all the Max Brenner's I have been to I recommend this one.